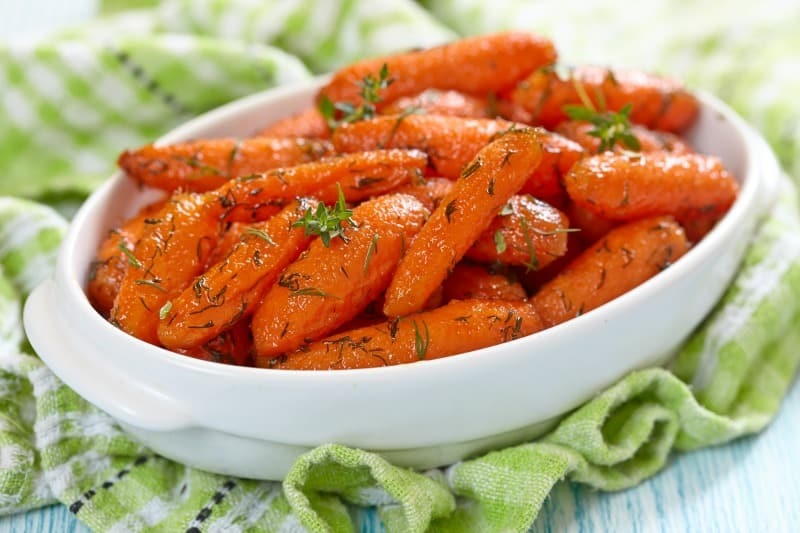 Carrots are packed full of vitamins and minerals and have so many health benefits they could be classed as a superfood. Some heritage varieties contain over 30% more beta carotene than their orange cousins. Growing carrots from seed is not only easy, but very rewarding. Did you know? 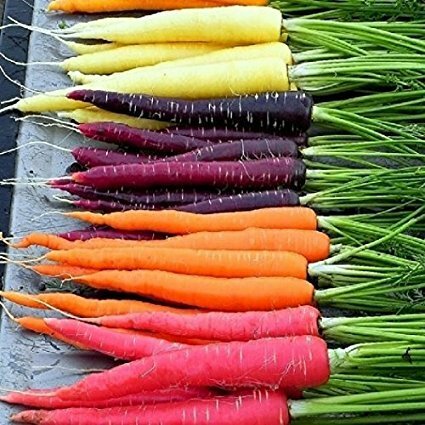 Carrots got their color as a results of selective breeding by the Dutch, who wanted to change the white, purple or black carrot color to an orange, just to celebrate The House of Orange. A rock free soil is important because if the carrot encounters a stone it will grow around it causing your carrots to be anything but straight. 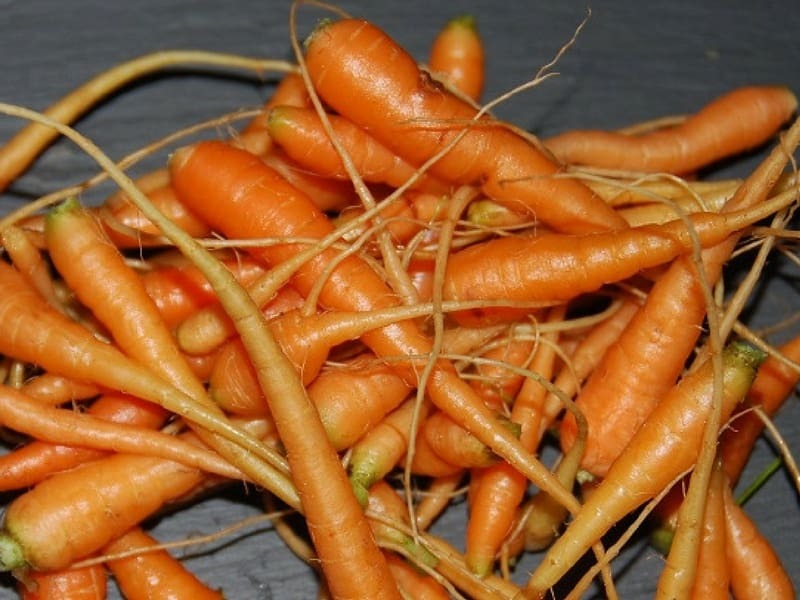 You don’t need to enrich the soil for growing carrots because the level of nutrition in a manured bed will cause the carrot to spit and spread. hammer a metal spike into the ground at a depth of about 6″ and move the spike in a circular motion to make a hole that is wider at the top. Then fill the hole back up with general purpose compost and sow the carrot seed at the top (sow 3 to 5 seeds in each hole). Carrots should be spaced about 1″ – 2″ apart, but because the seeds are so small, sowing them at correct spacing is impossible and you will need to thin out seedlings. Start by thinning to half spacing while seedlings are small. Later on, thin to full spacing by pulling carrot fingerlings you can use in your salads. YUM! Do the same for the spike and hole sowing method to leave one carrot per hole. 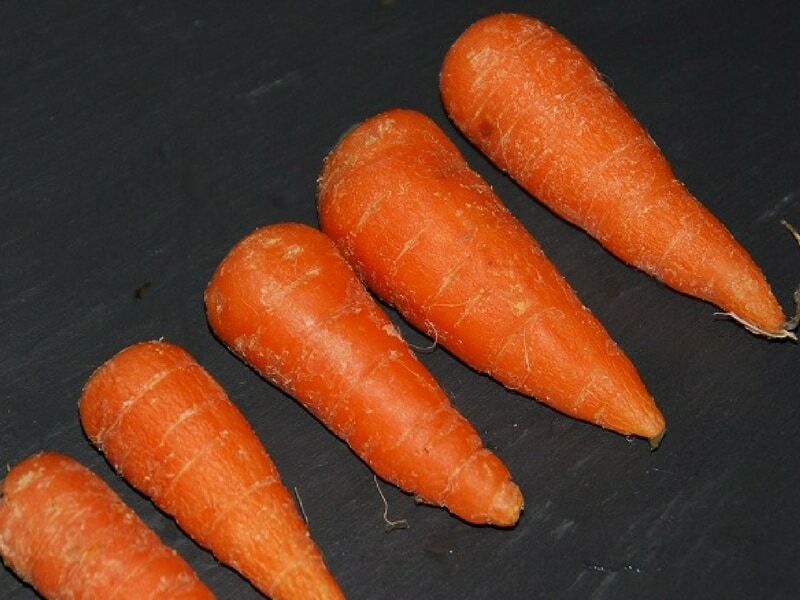 If you have particularly stony ground you could grow short dumpy carrots such as Chantenay. The main pest of the carrot is the Carrot Root Fly. She causes damage by laying eggs in the soil next to the carrots and the larvae eats into the vegetable. 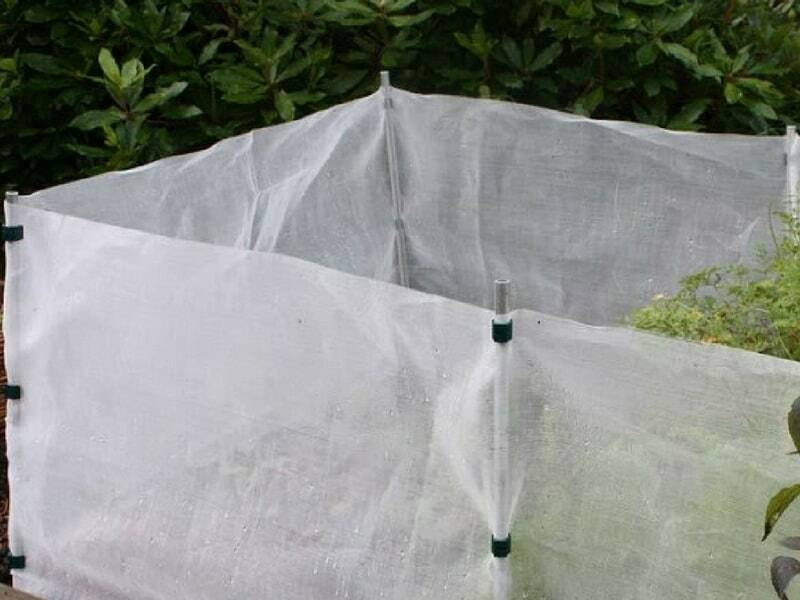 There are a number of ways of protecting your carrots, the best of which would be to put a fleece barrier around the carrot bed up to 25″ high. The Carrot Root Fly flies no higher than this so a barrier will protect your crop. You could also plant carrots with alliums to hide their aroma. Also avoid thinning during the day, as the smell will attract the fly. You are better off thinning at dawn. 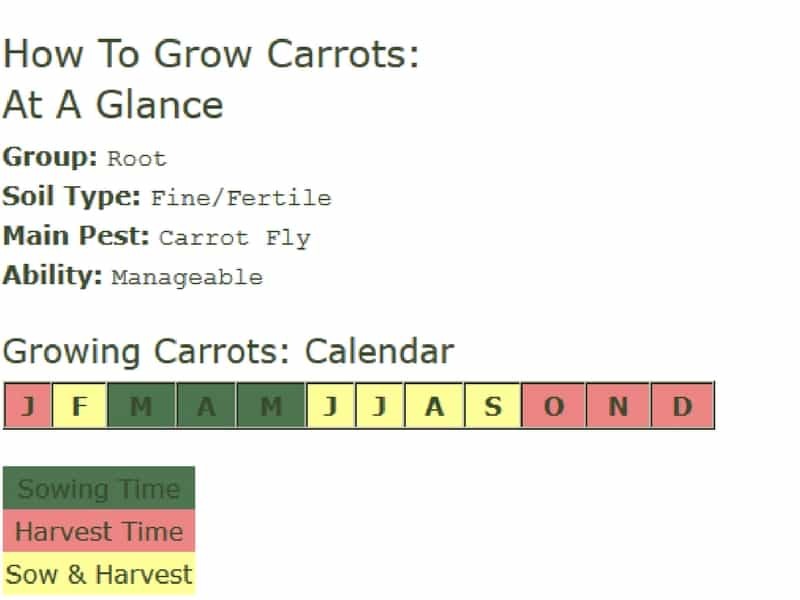 Keep in mind that the Carrot Root Fly is not flying in June, so if you planted your seeds earlier, you can do some thinning during this month without any trouble. Sowing to half spacing before your final thinning of seedling will provide plenty of carrot fingerlings for salads, and what is left will start to reach maturity from June onward. When you’re in the mood for some carrots, just pull them out by lifting the soil with a fork, while pulling the carrot by hand from the top. If you want to harvest baby carrots, they’ll be ready in 7 to 8 weeks form planting. They need a few more weeks to reach full maturity. If you live in an area where the ground doesn’t freeze, you can leave carrots in the ground till spring. Otherwise, harvest and store them in a cool place by covering them with damp sand or by blanching and freezing. Homegrown carrots are amazing right out of the garden: all you need is clean them up and eat. Use them raw in salads, roast them, or include them in soups, stews and other delicious dishes you create with your garden produce.